Putnam Bank through its Foundation donated $3,000 to support The Last Green Valley’s annual Walktober celebration. Walktober is TLGV’s premier event, designed to raise awareness of the significant cultural, natural, and scenic resources of The Last Green Valley and also promotes several fairs, festivals, and events occurring during the fall season. 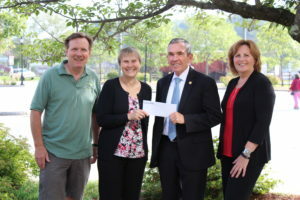 Putnam Bank also donated $1,000 to sponsor Tastes of the Valley, a fundraising event which showcases locally grown products prepared by local chefs, and $1,000 to sponsor Acorn Adventures, a program for children and their families to get outside and explore. Putnam Bank, chartered in 1862, is a $512 million Connecticut-chartered bank. Putnam Bank has branch offices in Putnam, Pomfret Center, Danielson, Plainfield, Griswold, Gales Ferry, and Norwich. It also operates a full-service loan center in Putnam. Stock is traded through NASDAQ under the symbol PSBH. For more information call (800) 377-4424 or visit putnambank.com.